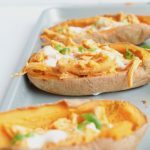 Healthy Buffalo Chicken Sweet Potato Skins – A super simple recipe that is the perfect blend of sweet and spicy. Great for game day or easy entertaining! Are you ready for some FOOTBALLLLLL?!??! …Yeah. me neither. If I want to see crying and drama every 5 seconds, I’ll watch Real Housewives of Orange County. Thank you very much. We all know that football game watching is 5% about the ACTUAL game, and 95% about the food. Let’s be real people. And you can’t spell football with BUFFALO. Technically speaking, you can, but I’m all about those food metaphors, so we’re gunna go with that. Seriously though, if you find yourself at any sporting event viewing party, and there is not a thing smothered in buffalo sauce, GET OUT. Get out as fast as you can. These are people who can’t be trusted. 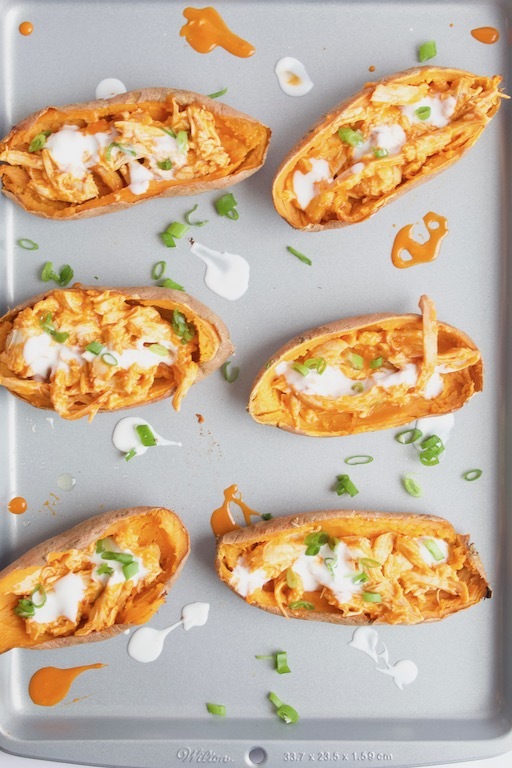 I like to consider myself much like these buffalo chicken sweet potato skins. Sweet on the inside, but full of fury on the inside. …Or maybe just chicken. Let’s go with the fury, it sounds more badass. These are probably the easiest appetizer that will appeal to both those 5% sports fans, and the 95% food fans. Oh hell, why are we even talking about sports anyways? Make these any ol’ time, and days will be made. If you’re looking for even more party recipes, head on over to my appetizer page for inspiration! Buy in bulk. Bigger packages, such as the chicken and Greek yogurt are a better bargain than smaller packages. You can freeze the chicken you don’t need, and use the Greek yogurt for a quick breakfast or snack! Use store-brand. Items such as the buffalo sauce can be bought using the store-brand, which tend to be less expensive. A super simple and gluten-free recipe that is the perfect blend of sweet and spicy. Great for game day or easy entertaining! Scrub sweet potatoes, and pierce with a fork. Wrap each in a damp paper towel, and microwave on high for 6 minutes, or until softened. Let cool, cut each in half, and scrap out flesh leaving a thin layer behind. Place potato skins on a baking sheet, and coat each with cooking spray. In the meantime, combine chicken, buffalo sauce, and garlic powder in a bowl. In a separate bowl, combine the yogurt with water or milk. Set aside. When potatoes are done baking, fill each with chicken mixture. Top each with a drizzle of yogurt, and green onions. Microwaving the sweet potatoes instead of baking them cuts down the prep time significantly. Highly recommended. Dairy free? Leave out the yogurt, or top with dairy-free yogurt instead. 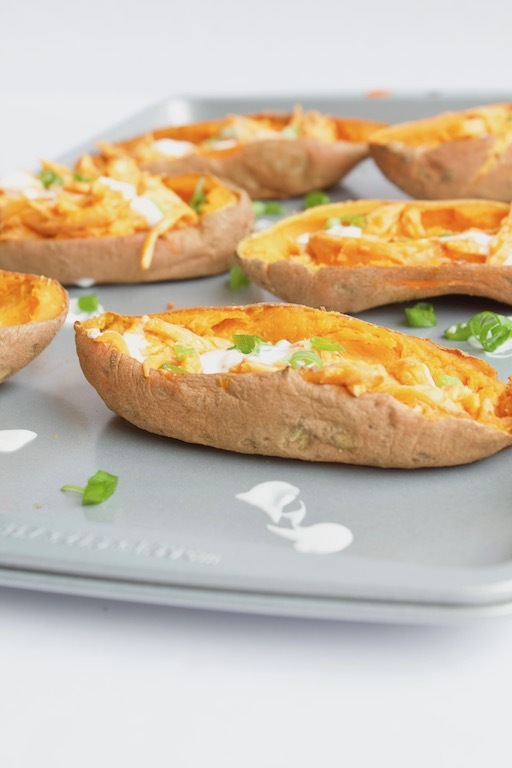 Baking the sweet potato skins helps crisp them up, and hold the filling better. Don’t skip! Not a buffalo fan? Mix the chicken with BBQ sauce instead! Meat free? Swap the chicken for cubed tofu or chickpeas in place of the chicken. Pin this recipe to your Appetizer board! These look SO good! I just made some regular potato skins for my blog for superbowl – but love the idea of using sweets! I love any and every type of potato skin! These look amazing, I haven’t had potato skins in a long time. I like both sweet and spicy! Thanks Samantha! You could also make them with BBQ sauce instead! Heck yes! These look so good. I make something relatively similar, and if I don’t already have precooked chicken I’ll just toss some chix breasts in buffalo sauce in the crockpot. Easy!! Such a great idea! Doesn’t get easier than that! These look so delicious. I wonder if my kids would eat them. I know my husband and I would! Hope you enjoy if you give them a try! Goodness these look delicious – I am drooling! These look soooo good!!! Perfect for the Super Bowl coming up! Just in time for Superbowl! These look delicious. Love this idea! I’m in a recipe rut right meow so thank you! I don’t eat chicken, but this looks oh-my-gosh DELICIOUS!! I totally need to make a plant-based version of this! Yum! These would totally be perfect for the Superbowl! What a fun recipe! 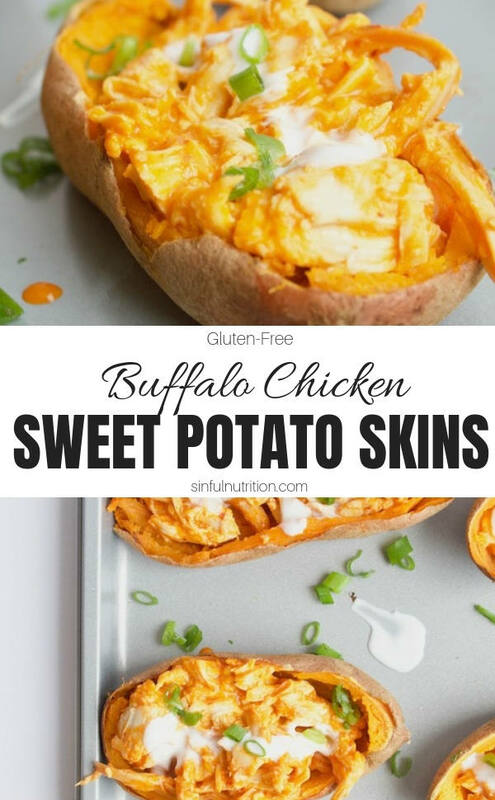 Fun fact – potato skins were my FAVORITE growing up, but I love this buffalo take! Hubba Hubba!! I still have yet to try using Sweet Potatoes as the vehicle for food!! 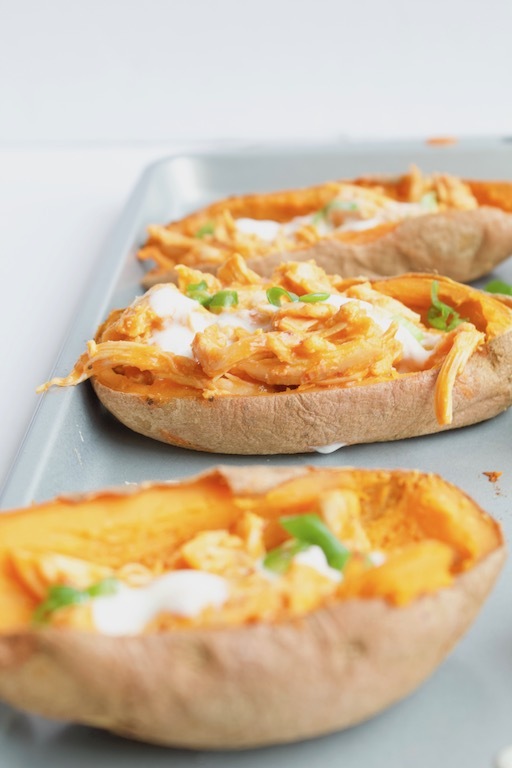 And I am OBSESSED with sweet potato – so I need to JUMP ON THIS TRAIN, asap! Oooo these look so good! I’ll have to make these for dinner soon. What a fun idea, and a really tasty one. Can’t wait to try!